At present these six catalogues in EMLO contain metadata for nearly 4,000 letters, most of which are conserved in the Royal Collections at The Hague, with smaller portions at the National Library in The Hague and Landeshauptarchiv Dessau. The letters were written in English, French, German, Latin, or Dutch and they date between 1605 and 1726. 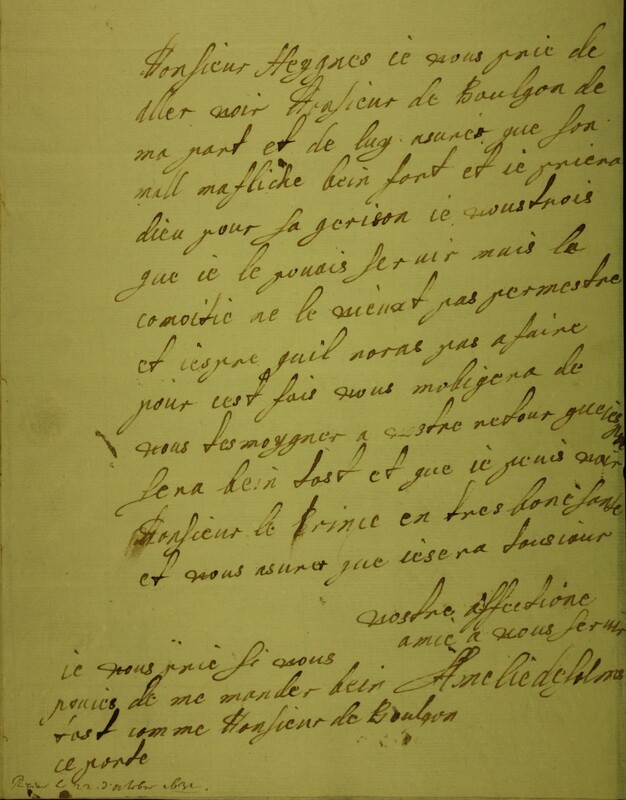 Almost all of the letter records in EMLO provide links to digitized copies of the scanned letters, marked as ‘manuscript image’, and links to the digitized editions of Archives ou correspondance inédite de la maison d’Orange-Nassau (ed. G. Groen van Prinsterer); Correspondentie van Willem III en van Hans Willem Bentinck (ed. N. Japikse); Briefwisseling van Anthonie Heinsius 1702–1720 (ed. A.J. Veenendaal jr.); and Lettres et Mémoires de Marie Reine d’Angleterre, Épouse de Guillaume III (ed. M. Bentinck) have been added as well. In the near future further letters from a number of other archives, such as Tresoar in Leeuwarden, will supplement these catalogues, and metadata for the correspondences of the wives of the 16th- and the 18th-century stadtholders will be prepared for publication. Nadine Akkerman, Courtly Rivals in The Hague. Elizabeth Stuart and Amalia von Solms (Venlo, 2014). Nadine Akkerman and Birgit Houben, eds, The Politics of Female Households: Early Modern Ladies in Waiting Across Europe, Rulers & Elites, vol. 4 (Leiden, 2013). Frans Blom, Els Kloek, and Ad Leerintveld, eds, ‘Vrouwen rondom Huygens’, De Zeventiende Eeuw, 25, 2 (Hilversum, 2009). James Daybell, The Material Letter in Early Modern England: Manuscript Letters and the Culture and Practices of Letter Writing, 1512–1635 (London, 2012). James Daybell and Andrew Gordon, Women and Epistolary Agency in Early Modern Culture 1450–1690 (Abingdon, 2016). James Daybell and Andrew Gordon, eds, Cultures of Correspondence in Early Modern Britain (Philadelphia, 2016). Margaret J. M. Ezell, ‘Domestic Papers: Manuscript Culture and Early Modern Women’s Life Writing’, in Michelle M. Dowd and Julie A. Eckerle, eds, Gender and Women’s Life Writing in Early Modern England (Ashgate, 2007), pp. 33–48. J. N. Fernhout, Eindelijk weer samen. Inventaris van de archieven van stadhouder Willem II en Amalia van Solms en enige verwanten (The Hague, 2012). Cissie Fairchilds, Women in Early Modern Europe, 1500–1700 (Harlow, 2007). Ann Hughes and Julie Sanders, ‘Gender, Exile and The Hague Courts of Elizabeth, Queen of Bohemia and Mary, Princess of Orange in the 1650s’ in Philip Mansel and Torsten Riotte, eds, The Politics of Legitimacy from Marie de Médicis to Wilhelm II (Basingstoke, 2011), pp. 44–65. Huygens, Constantijn, Briefwisseling van Constantijn Huygens 1607-1687, digital correspondence database (The Hague, Huygens ING). Ineke Huysman and Ad Leerintveld, ‘New perspectives of the digitized correspondence of Constantijn Huygens (1596–1687)’, Dutch Crossing, 38, 3 (2014), pp. 244–58. Marika Keblusek and Jori Zijlman, eds, Princely Display: The Court of Frederik Hendrik of Orange and Amalia van Solms in The Hague (Zwolle and Den Haag, 1997; translation of Vorstelijk Vertoon, 1997). Els Kloek, ed., 1001 vrouwen uit de Nederlandse Geschiedenis (Nijmegen, 2013). Els Kloek, ‘”Een nieuw studieveld”: Vrouwengeschiedenis, interdisciplinariteit en de Nederlandse zeventiende eeuw’, De Zeventiende Eeuw, 14 (1998), pp. 218–27. S. Mendelson and P. Crawford, Women in Early Modern England, 1550–1720 (Oxford, 1998). A. P. van Nienes and M. Bruggeman, Archieven van de Friese stadhouders (Hilversum, The Hague, and Leeuwarden, 2002). Helen Ostavich and Elizabeth Sauer, eds, Reading Early Modern Women (New York and London, 2004). Judith Pollmann and Robert Stein, eds, Networks, Regions and Nations: Shaping Identities in the Low Countries, 1300–1650 (Leiden, 2010). Daniel Starza Smith, ‘The Material Features of Early Modern Letters: A Reader’s Guide’, Bess of Hardwick’s Letters (Glasgow, 2013, accessed 25 August 2016). For biographical information regarding each individual stadtholder’s wife, please see the references on the separate catalogue pages listed above. For a more extensive bibliography of female rulers and informal power, see Akkerman and Houben, eds, op. cit. above, pp. 371–98.